Glenda’s beef adobo recipe is a fine example of slow cooking. And when she says “slow,” she’s not kidding. The beef has to be steamed for four long hours, while the sauce has to be simmered for two. In other words, it’s not exactly for the hurried cook, requiring as it does copious amounts of time, planning, effort and infinite patience. But the results—which we tasted after the cooking demo—are all worth it. Subjected to four lengthy hours on the stove, the beef was steamed into tenderness, pliant and yielding to the bite. Served with the velvety sauce and a cone of ube rice, it was comfort food elevated to the next level. Glenda also showed us how they would plate the dish in Via Mare. 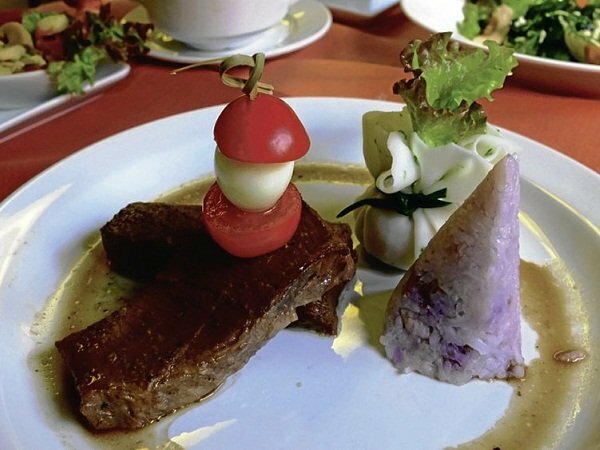 Instead of serving the adobo with chopped tomatoes and red eggs as is often done by the home cook, she threaded cherry tomatoes and hard-boiled quail eggs into a cocktail skewer and speared this on top of two evenly sliced beef. Along with the ube rice and vegetables wrapped in a pouch of lumpia wrapper, the presentation was one pretty, appetizing dish. 1 Put the beef in a marinating pan. In a bowl, combine the garlic, peppercorns, vinegar, soy sauce, bay leaves and salt. Pour over the beef. Cover the bowl and marinate overnight in the refrigerator. 2 When ready to cook, wrap the beef tightly in two layers of aluminum foil. Steam over low heat (120°C) for about four hours or until beef is tender. 3 Put the meat into the steamer only when the water is already boiling. Start counting the cooking time from the time you’ve put the meat into the steamer (with the water already boiling). 4 Put all the ingredients for the sauce in a casserole and bring to a boil. Reduce heat to a bare simmer and cook for about two hours. 5 Strain the liquid and discard the solids. Pour the liquid into a small saucepan. 6 Taste it and, if needed, adjust the seasoning to taste (may add more vinegar, salt or soy sauce). If desired, heat the sauce further until it thickens.